A technical assistant from Astoria Culinary and Hospitality Institute (ACHI) assists a student with the processes. As part of the partnership with Astoria, students were provided laptops to allow them to experience firsthand how to process different procedures involve in front desk services. Students were given a certificate of completion. To elevate the skills of its students in hospitality management and other related skills, the College of Home Economics (CHE), through the initiative of Dean Dr. Lucia M. Santos and the Hotel and Restaurant Management (HRM) Department, participated in the Hotels on Wheels Training Program led by Astoria Culinary and Hospitality Institute (ACHI) last January 25-26, 2017 at the WMSU Social Hall. 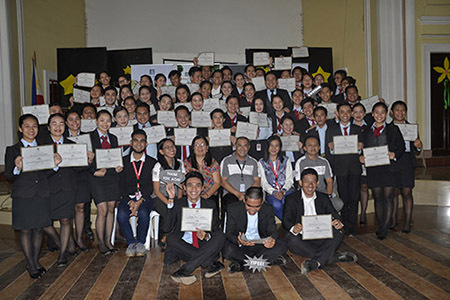 A total of 58 fourth year BS HRM students participated in the two-day training under the directorship of Mr. Danilo Molina, Director for Academic Affairs of ACHI. ACHI is the training institution of Astoria Hotel that partners with schools and individuals, especially hospitality and tourism management students, to enhance their professional competency in the hospitality industry through rigorous hands-on training and coaching. The pioneering training included a seminar discussing the functions and responsibilities of the Front Office including its sub-units like the front desk and bell service. 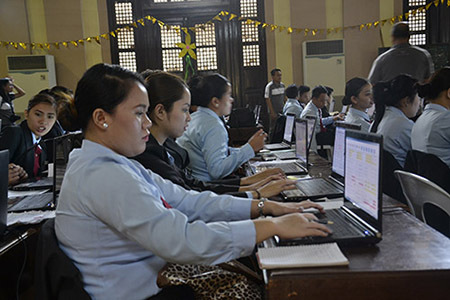 ACHI also provided laptops to allow the students to process firsthand the procedures in taking reservations and registration of guests, special billing instructions, checkout procedures and other hospitality operations. CHE Dean Dr. Lucia M. Santos emphasized the importance of the training, “This training will strengthen each student’s credentials and increase their marketability in the industry,” said the dean. 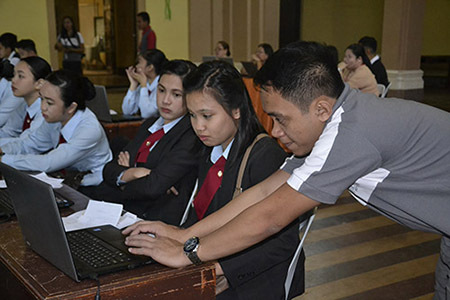 “The hands-on experience offers the students a better grasp of the real business, and it helps them to be globally ready and competitive,” she added.